I was excited to have a chance to do the Stampin’ Addicts Color Challenge today. It is a stunning group of colors that I never would have thought to put together — Rich Razzleberry, Old Olive, Brushed Gold, and Black. As I was trying to decide what to do with the gold in particular, I remembered that my friend Paula had heat embossed some butterflies (from Great Friend) in both gold and silver and they looked stunning. So I thought that I would try that too! 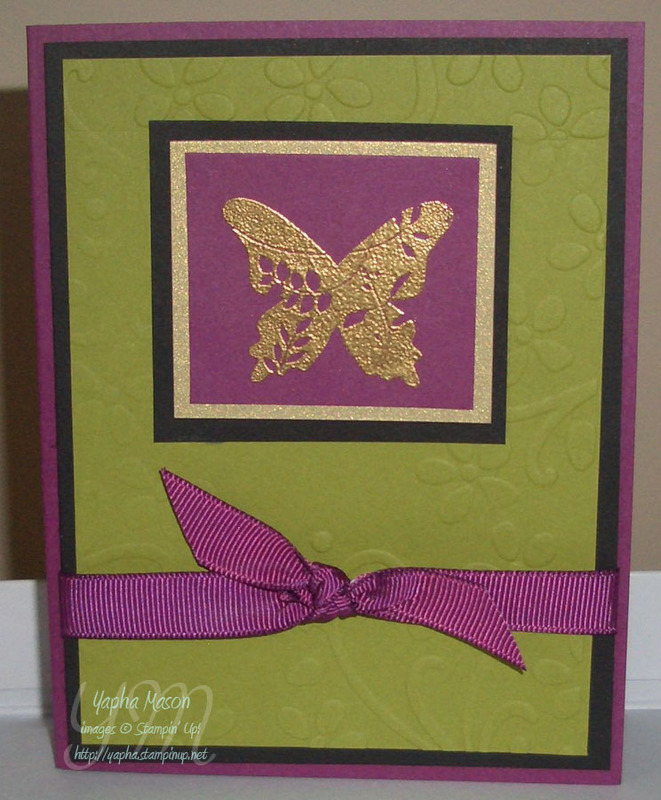 I also broke out the new Elegant Bouquet Textured Impressions Embossing Folder. This has a beautiful embossed images in the lower right hand corner. I decided that I wanted a little more embossing, so I flipped it around and ran it through again. It wasn’t quite the same impression the second time. I think I need to play with this idea a little more.